Wrap-Around Bed Skirts with elastic binding - 14" drop - Free Shipping. The 14" Wrap-Around Bed Skirts are simple to install around any box spring without having to lift or remove the mattress. The Wrap-Around Skirts have a elastic band sewn around the top instead of a platform. The elastic band makes the dust ruffle/bed skirts easy to install and prevents the Wrap-Around Bed Skirt from sliding around on the box spring after the easy installation. 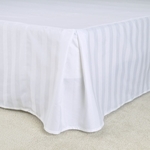 Wrap Around Bed Skirt / Dust Ruffles have a 14-inch drop on both the Twin/Full size and the Queen/King size. The bedskirts are constructed from an easy-care poly/cotton blend which is machine washable. Available for wholesale purchase by the bulk case pack of 6 bed-skirts in 9 colors: White, Beige, Burgundy, Black, Navy, Light Blue, Light Green, Dark Green, and Pink.